The Wells Fargo Championship has been played at the Quail Hollow Club since 2003 under several different names. The par 72 is a firm test that usually plays slightly above par, though it ballooned to a full stroke over par during last year’s championship. The Club was awarded the 2017 PGA Championship and was given a minor renovation over the past year; this tournament will be the first played under the new conditions. The most important change is the conversion of the greens, which were oft-criticized, from bent grass to bermuda grass. Of all courses measured by the Shot Link system Quail Hollow’s greens were the 4th toughest to putt on over the last decade (half a stroke/round harder than average). By my count, there were also minor changes to three holes that should slightly affect play and one complete re-design of the 16th hole that dramatically changes how it plays. I anticipate the new greens will cause the course to play to par on average, possibly lower with better conditions than last year. Quail Hollow is notable, first off, for the extremely low rate of fairways hit in recent tournaments. The pros have hit only 49% of their fairways since 2011 – the worst of any PGA Tour course. However, the inaccuracy hasn’t affected scoring much. Once the difficulty of the greens and length of the course are accounted for, Quail Hollow plays much more like a course where 60%+ fairways are hit. Last year’s conditions depressed driving distance some, but most years see driving distances at about PGA Tour average. My numbers indicate the rough is about average in terms of difficulty (a shot in the rough typically adds 0.2 strokes to what a player would score from the fairway). There are some danger areas on certain holes to catch wayward drives, but the longer hitters while be advantaged here. There are four par 5s – all able to be reached with the right two shots – and both the par 4 8th (not last year) and the par 4 14th (final round last year) can be set-up to encourage players to go for the green. Overall, longer hitters were advantaged in attacking the greens. In the final round last year, the longest third of hitters went for 61% of greens in two (average 60%), the middle third of hitters went for 38% of greens (average 50%), and the shortest third went for only 19% of greens (average 38%). That means longer hitters go for more greens than normal here and shorter hitters go for fewer greens than normal here; that’s clearly an edge for the longer and more aggressive pros, especially if #8 or #14 are played as drivable par 4s. The danger here is off the tee. The fairway bunker to the right gobbled up 20% of drives last year and shots played out of it were 0.4 strokes worse than those played out of the fairway. The rough penalty here was no worse than normal (0.2 strokes). Only the very longest hitters have to be concerned about driving it too far and ending up in the trees long left. The pros split 50/50 in terms of targeting right or left off the tee; shots towards the left ended up 0.1 strokes easier than those targeted right. 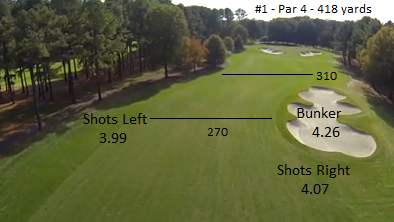 This is the shortest par 5, and one that’s easy to hit in two if you get to the right position off the tee. There’s a creek right that has to be avoided. A better miss is to the left; the bunkers played only 0.25 strokes harder than the fairway last year and 6/10 of guys who ended up there attacked the green in two. The left also provides a safer angle to attack the green without bringing the water to the front right of the green into play – particularly important with the front right pin position. Shots targeted left played 0.1 strokes easier than those targeted right. Short on the card, but this wasn’t played as a drivable par 4 last tournament. Most opted to lay-up to around 70-80 yards to go. Bunkers were added to the left of where players lay-up which might indicate they’re going to move the tees up at least one round. Otherwise, the lay-up and wedge game will continue; only 14% of approach shots ended up in the rough or bunkers. Only 17% of pros went for this green in two, though it’s possible with a long and accurate drive. The real challenge is off the tee; the bunker left is a danger, but playing right brings the trees into play and eliminates any hope of getting it around the green in two, especially when the pin position is to right. 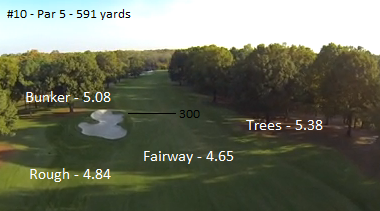 The fairway played to 4.65, the rough 4.84, the bunker 5.08, and the trees areas to 5.38. Only 29% of pros hit the fairway here, with most almost everyone else ending up in the rough/trees right. I think the pros were too cautious here last year and gave up distance on the drive just to hit the fairway. 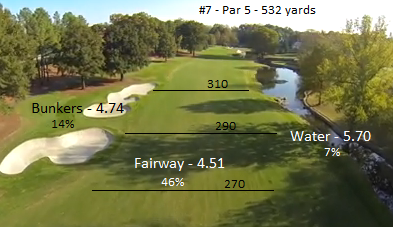 Yes, the fairway here is very narrow and the trees are dangerous, but the pros gave up 20 yards of distance and only shot 0.15 strokes better from the fairway – even including some obstructed shots from the rough. This hole was set-up to drive the green in the final round last year. The tees were moved forward 20 yards, the hole location was set at the very front of the green, and the result was 29 birdies, a near chip-in eagle for Phil Mickelson, and a lot of excitement coming down the stretch. With the tees pushed forward, almost half the field went for the green off the tee. With the tees back, the drive becomes a little dangerous with water left and bunkers on either side of the landing area. This is the very difficult finishing hole. There’s danger here from the creek down the left, but as with most long par 4s, the main danger is the rough. This hole saw the largest rough penalty of any hole at Quail Hollow (0.5 strokes). 24% of players couldn’t even get to within 50 yards of the pin with their approach shot last year. All images taken from the Quail Hollow Course Tour. Flyovers for all 18 holes are available at that link.